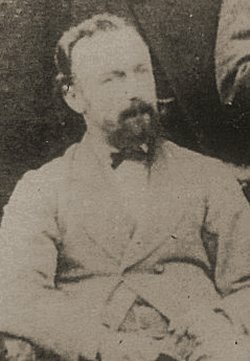 Charles Tite was born in Taunton in 1842, son of publican Walter Tite (1777-1855) originally from Bristol, and his wife Elizabeth née Higgins (1796-1870). In the 1851 census Charles was living at the Spread Eagle Inn, North Street, Taunton, with his parents and two older sisters Lucy and Emily as well as a house servant. 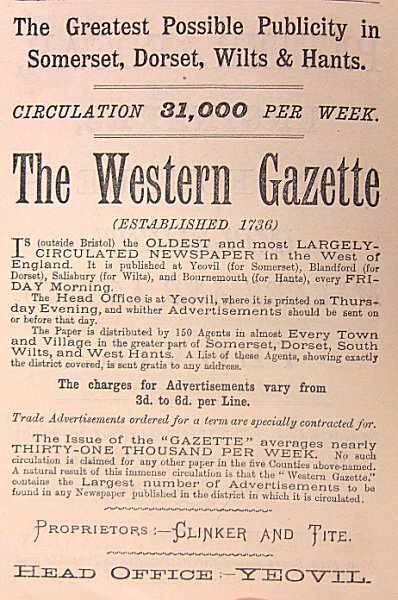 In 1863 Charles Clinker founded his own newspaper which he called 'The Western Gazette'. The first issue was bought out on Saturday, 21 February 1863. The weekly newspaper proved extremely popular causing a move to premises in Sherborne Road. Charles Tite went into partnership with Charles Clinker, and together they acquired the rival Yeovil newspaper, the century-old Western Flying Post. They combined the two papers under the heading of 'The Western Gazette and Flying Post' on 21 June 1867. 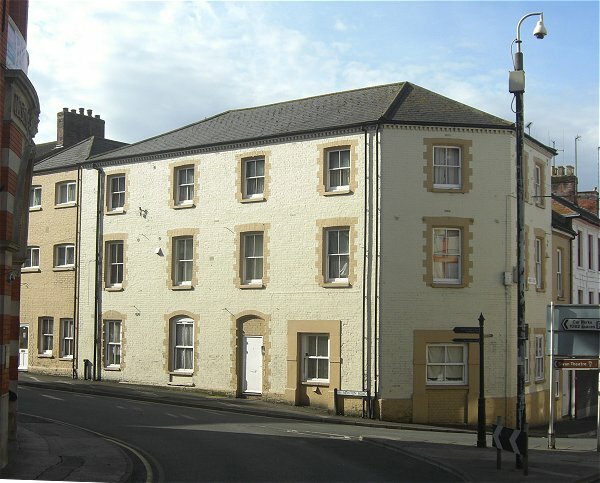 In 1870 the paper moved to purpose-built offices, photographed below, on the corner of Lower Middle Street and Newton Road. In 1872 the words 'Flying Post' were dropped and the newspaper became simply 'The Western Gazette'. In 1877 Clinker & Tite bought Pullman's Weekly News which had been published in Crewkerne by its founder George Pullman since 1857. It continued to be printed in Crewkerne after the sale but printing transferred to Yeovil in 1881. In the 1871 census Charles and Hannah, aged 29 and 25 respectively, were living in Wyndham Street just yards from Charles's office. He listed his occupation as newspaper proprietor. Hannah died in the spring of 1879 aged just 33. Charles Tite and Charles Clinker were both arrested on 18 May 1880 and held in Her Majesty's Prison Dorchester. 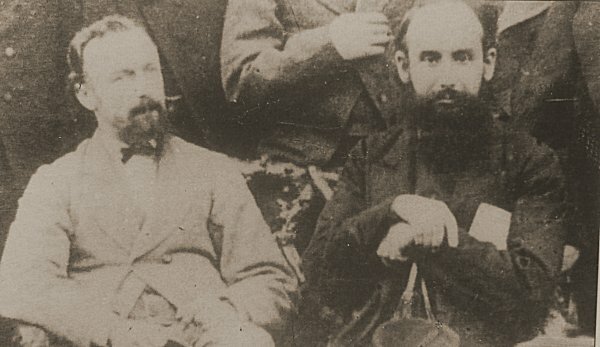 They were charged with "Printing and publishing, in a paper called 'the Western Gazette', a certain libel concerning Vere Fane Bennett-Stanford, Esq, at Shaston St James, on 23 April 1880". They were tried before Mr Justice Grove on 13 July 1880 and the Order of the Court was the "Bill for libel ignored". In the 1881 census Charles was living at 23 Sherborne Road with a housekeeper. His neighbour one side was Charles Clinker and his family, his neighbour to the other side was glove manufacturer Herbert Southcombe. Within a couple of months, at the age of 39, Charles Tite married Caroline Mary Wilson of West Derby, the 32-year-old daughter of John and Caroline Wilson. In 1886 Charles's partner, Charles Clinker, died while on a business trip to London. It is likely that his partner's death gave impetus to Charles Tite's early retirement. In the 1891 census Charles and Caroline, together with a housemaid, were living at 24 South Street. Charles gave his occupation as "living on own means". Charles accumulated a large and comprehensive collection of local interest books, primarily concerning South Somerset and, particularly, Yeovil. The 'Charles Tite Collection' is now housed in the reference section of Yeovil library. By the time of the 1901 census Charles and Caroline had moved to Bishops Hull, Taunton, and were living there with a cook and a housemaid. Charles was now aged 59 and gave his occupation as "Retired Newspaper Proprietor". Ten years later Charles and Caroline were living at Stoneleigh, South Road, Taunton. Charles gave his occupation simply as 'private means'. Caroline died on 16 September 1932 and Charles Tite died at home on 16 May 1933. His will was proved in Bristol in July and his effects were valued at £20,000 (£1,200,000 at today's value). 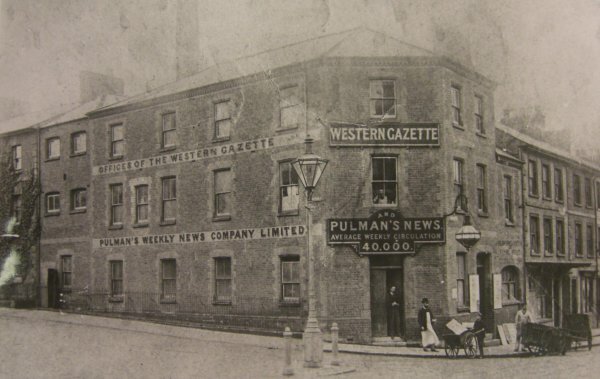 The Western Gazette offices, photographed about 1900, on the corner of Newton Road running off to the left and Middle Street off to the right. This was before the new building was built on the opposite corner in 1906. This building still survives but is now flats.